I sometimes give my little girl a topic to go and write about. We might do this if she is at home from school for the day or looking for something to do on a rainy Sunday afternoon as her brother sleeps. Her latest subject was ‘Something I don’t understand’. I asked her why she would like to be an adult, “Because then I wouldn’t have so many jobs to do”. This is not the reply I expected. I would have understood wanting to drive a car, getting to buy things at the shops, being able to cook at the stove or having babies. But this answer threw me. My precious Lulu, stay young little one. So much of adult life is jobs, a constant stream of jobs, intersected only by decisions before going back to your jobs. There are few places more perfect than a loved and adored six year old body and mind. Yes, you need to put the dishes away, but as an adult you will also need to wash the dishes. Yes, you need to open the blinds, but as an adult some days the brightness will not filter through. Yes, you need to be kind to your brother who loves you, but as an adult you will need to be kind to people who are not kind to you. Yes, you need to go to school, where you love your teacher, friends and all that you learn. But when you are an adult you will need to go to work, where although there may be aspects you enjoy, there may also be aspects you despise. Embrace your young mind little one, your imagination, your freedom and creativity. Treasure the spring in your step, the joy in your voice and the simplicity you have in being present. We adults long to be back there. What we wouldn’t give to be six again! Have you noticed that adults don’t get piggy backs, or balloons when we go to the dentist, or bedtime stories, or tickled until tears of laughter run down our checks? Imagine life without piggy backs and tickles! It doesn’t sound near as grand as being six, where you can still make cubbies under your bed and hide under the kitchen table. Do you know what I don’t understand my precious baby girl? I don’t understand why we have to grow up, why can’t we just be kids? I wish I’d been more patient. Place the coconut milk, chocolate and honey into a medium sized saucepan over low heat. Stir continuously until chocolate has melted and the mixture is well combined. Keep the heat low as you do not want to burn the chocolate. Once melted and well combined remove from the heat and set aside. In a medium sized bowl whisk the eggs until the yolk and whites are well combined. Stir in the almond meal. Stir in the chocolate mixture. Once well combined pour the mixture into your prepared cake tin. Place the into the oven and bake for 1 hour. Remove from oven and cool in the tin for 30 minutes before gently transferring to a cooling rack to cool completely. note – if you are wanting to ice the cake the Nutella recipe works perfectly. Hi there, sounds delicious, wondering if you could use a square cake tin instead of the round? Of course I would find this recipe when I’m out of cocnut milk. I can’t wait to try it out. nice recipe but need some help can’t use almond meal because of nut allergie,.. what can i use instead and what are the adjustments when i use it?? I shall get working on a nut free version, I wouldn’t like to recommend anything that I haven’t tested sorry. Looks amazing- generally what % dark Choc do you use?? 70-80%? Either 70% or 85% depending on who I am making it for. I find 70% in this cake appeals to pretty much everyone but the darker is best saved for those who enjoy dark chocolate. I hope this helps. T his is a very easy. …..amazingly delicious cake! I am vegan so I did change it slightly. Oh I added raspberries too! I made icing. ..pure icing sugar with mashed upon raspberries to get the amazing colour. Hi Tracey would love to know how much cacao was a suitable substitite for the chocolate!? Thankyou! Made this last night and was a hit! Iced with the nutella recipe, but subbed almond butter and maple syrup for the tahini and honey. Everyone loved it. Thanks for this recipe! Is there a possible substitute for almond meal? Cant get it in my country. Thanks! You can make your own by grinding almonds to a flour, does that help at all? Thankyou Bianca, I have been needing this recipe! Can’t wait to try it. I loved your story too, it brought tears to my eyes , I have a nearly 6 year old too who is keen to grow up..
Hi Blanca, hoping to make this recipe on the weekend for my little boy’s birthday party, but as cupcakes rather than one cake. Do you have any idea roughly how long I should bake them for? Thank you! I haven’t made them as cup cakes but perhaps test after 20 minutes and every few minutes from there? I am a huge fan and cook your recipes all the time. Just wondering what dark chocolate you used as I cannot find one without sugar? so as I procrastinate and avoid my “jobs” by reading your post, I am overwhelmed with the urge to cook this for my kids. Not because they need chocolate cake, but because I imagine them coming home from school this afternoon hot and bothered and there, on the bench, is a freshly baked chocolate cake. Things of dreams :)))))) Thanks for the reality check, I am ditching my “jobs” which always seem so important, and I’m going to make my kids cake so when they walk in the door this afternoon I get to see their gorgeous, precious smiles…something I know will not happen forever. pffft, who needs to balance the books anyway!!!! Tried it with 5 bananas and the kids love it! just wondering Bianca – could this be made with cacao powder and cacao butter or coconut oil instead of bought chocolate ? I might give it a go and let you know the outcome? I realised, just in time that I only had 200g of chocolate so I halved the recipe. I am now wondering how this will effect the cooking time? My three year old and I also made the 1 minute chocolate slice. Thank you again for such simple recipes that I can make with my daughter. Hi Bianca, just wanted to know if this will work without the hot water bath and just put it straight into the oven? Due to.a nut alery what could i substitute almond meal for?? I have only made this one this way. Is there a plain flour that you typically use? Would coconut flour work instead of almond meal?? You would need to use less. I would perhaps try 3/4 of a cup. I would love to hear how you go. Thanks! Is there a sub for honey? Yes most liquid sweeteners will work. Do you use rice malt syrup? Just wondering, at what stage of the cooling process do I remove it from the tin? My Mud Cake! Amazing!! Delicious! Followed the recipe perfectly… Doubled the Nutella for the icing! Thank YOU Sam!!! That is very kind! I love the pic and I really appreciate you sharing it here. I am glad the recipe was enjoyed. Thanks again, Bianca. I don’t usually comment but this was the most delicious thing I’ve ever made. So yummy and decadent. The almond flour made such a great flavor texture combo. I made your icing recipe too but used cashew butter instead of tahini. Anyway – this delicious cake made me (a total novice) feel like an accomplished baker – it was so easy to make but the results were awesome. Now I’m going to browse your site for more goodies. Thank you. Could u please tell me the percentage of coconut your tin of coconut milk has. As a lot vary from 100% down to about 55% most ppl assume it’s all about the same. Hi Stacey, yes it could be iced. Stacking I think would be ok. I would make them a day in advance and leave them in the fridge over night. It isn’t something I have done but I cannot see why it would be an issue. When cutting it does really stick to the knife so run a little hot water over your knife first. It is a dense mud cake. Am I making any sense? Yes, thank you 🙂 I shall have a practice run & see! thanks! Greetings from Arizona USA. I absolutely adore making your recipes and reading your stories. Thank you so much for your dedication to your family and good food. Can anyone help we to know how much 400 grams of dark chocolate chips translates into our US Cup measurements? I don’t have a scale. Thank you so much! ThanK YOU so much. I am glad you are enjoying my little space. I really appreciate the feedback. I just googled and 400 grams = 14.1096 ounces, does that help? Hi Sharon, they may not be deep enough. What is the depth? This is SO good! I used half the amount of dark chocolate, added one tablespoon of cacao and three tablespoons of coconut cream. It’s really moist and addictive. Thanks so much for all your lovely recipes! Absolutely delicious! Did it for my kids first birthday today and everyvody thought it was delicious. I think it was a bit undercooked though, even though it was in teh oven for a bit longer, I suppose different ovens, so will cook a bit more next time. Thanks for a great recipe! This is to die for! I made it for a birthday celebration and only had the afternoon before the party to make it. I was a bit worried about letting it cool properly. I ended up letting it cool for about 1 hour and then popped it in the fridge for an hour. Took it out, popped it out of the pan, added the nutella icing and it was amazing! Thank you! This cake is delicious. I found it gets yummier over about 4 days… If you can make it last that long!! I love your recipes, Bianca. All of the ones I have tried so far are delicious and simple with ingredients I love to use in my cooking. I recently purchased your cookbooks to save me time writing them up in my recipe journal. Thank you for sharing your love of healthy cooking with the rest of the world! First time making this ! Not much of a cook and found this easy especially being GF & DF. Very rich but nicely balanced with cream (husband not me !). Love the consistency. Thanks so much. You’ve made me look like I know what I’m doing ! Your site is awesome. Opened up my world immensely ! Is that canned coconut milk or the one in the cartons? Turned out brilliantly! I was skeptical about the nutella icing – but it was great!! What would you suggest as a suitable egg replacement for this recipe? 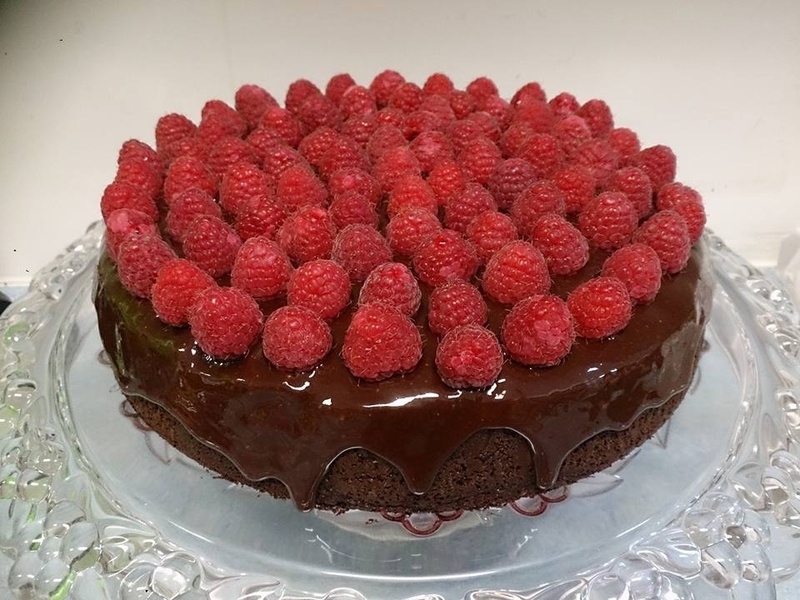 I have only made this one this way sorry but I will add a vegan chocolate mud cake to my to do list. YUM! Hi Bianca, just wondering if the oven temperature is fan forced or normal? Thanks! Halved the recipe because I didn’t have enough chocolate and it is so good!!! Also added a tablespoon of xylitol. For the icing I used a nut, seed and cacao spread and it worked perfectly. Thank you so much for the recipe. I’ve made this twice now and I halved the recipe both times and it is amazing! Didn’t do any icing, but it went really well with greek yoghurt and blueberries. Thank you very much for the recipe! Could you supplement the dark chocolate for cacao melts? Would that work? I have not tried that sorry. Hello, I have a question, can I substitute the almonds for say a mixture of coconut arrowroot please? I have only made it this way sorry. You might like the chocolate fudge cake, it is nut free. I love your recipes Bianca but I also really love your thoughtful stories. Just beautiful. Have a very Merry Christmas with your beautiful family who I feel like I know through your stories. I will be making this cake as I just so happen to have 400 grams of dark chocolate in my pantry. I mean, who doesn’t!?!! I’m a caterer and I use this for Dairy and Gluten free folks. It is so great and so easy and the ‘normals’ like it tooooo! THANK YOU! Hi Bianca! This looks delicious ?. Quick question – my son wants a chocolate banana cake for his birthday on Friday. Could I mash a banana into this recipe or would it be too heavy? Thank you! I am sorry for my late reply, did you try it? Oh dear i stuffed it. It went really really thick. Not like cake mix ? oh well its still going to be chocolatey goodness ? Did it work out ok for you? https://uploads.disquscdn.com/images/73ca37c0fd23a4849bcd2af1c5f9e6daa756fc51708eb1498f5040e7c4f57fec.jpg Made this yesterday for a going away cake for a lovely lady who I work with. Iced it with a coconut and hazelnut spread. Was the coconut and hazelnut spread store bought or made? If it was made, would you be able to share the recipe? Thanks. Just wondering if you think this would work with one can of coconut cream instead of coconut milk? Also, I may have to substitute the honey for some fructose intolerant people… I know rice malt syrup might work but what about maple syrup? Yummy mudcake. How long would you think it lasts in fridge? I’ve had some in the fridge for 5 days and want to freeze the rest. Should I freeze or thow it out? Thanks in advance. Hi, this sounds lovely. Two questions; is the coconut milk the one in a carton in the long life milk section or canned? Also is there an alternative to honey, as my hubs is not meant to have honey. Thanks so much. I use Rice Malt Syrup (fructose free), not sure if that helps you? With the coconut milk – I use coconut cream, shake the can well, and use that. I’m interested to try this, I’ve only used ground almond in citrus flavoured cakes before. Hi, could you use maple syrup instead of honey? In the mud cake. I made this but it came out really flat and dense – like a brownie. It was very tasty but didn’t look like the picture which seems to have some rise in it. Any thoughts on what I did wrong? Hi there I absolutely love this recipe, I’ve made this cake at least 4 times! I want to make it for Christmas but was thinking to change it up a little by adding some orange zest? I would like to make this for my daughter’s birthday – do you think it would work as a layer cake?